Acura, Honda’s luxury brand, is partnering with Marvel Entertainment to promote blockbuster film THOR. Acura is presented as the official vehicle of S.H.I.E.L.D., the fictional worldwide peace-keeping organization of the Marvel Comics Universe. Throughout THOR, S.H.I.E.L.D. agents drive various Acura vehicles, including the MDX, ZDX, RL and TL models. 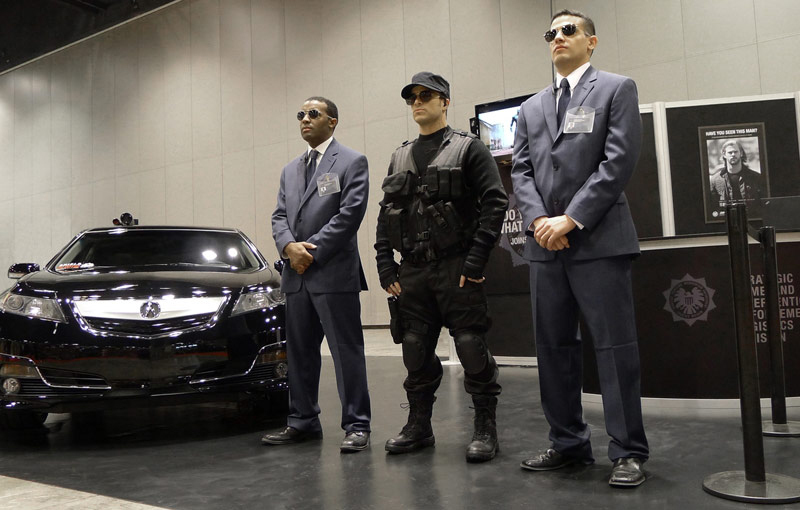 Acura is building awareness of the partnership at entertainment and auto shows with S.H.I.E.L.D. recruitment booths where recruits are able to take a picture and receive a S.H.I.E.L.D. ID badge. Acura’s interactive website for THOR, joinshield.com, serves as the hub of the national advertising campaign, allowing fans to immerse themselves in the world of THOR as actual S.H.I.E.L.D. agents. Users can receive their official ID badge, post it on Facebook and climb the ranks within the organization by completing assigned case files. Rewards for US residents include movie tickets, iPad®s, LiveScribe “smart pens” and the grand prize of an exclusive evasive-driving experience. Fans can also build their own virtual S.H.I.E.L.D. vehicle with over-the-top features to aid in their online adventure. The advertising campaign is composed of a multiplatform media buy, retail tie-ins and national ABC screenings of THOR with after-parties in select markets. The newly refined 2012 Acura TL will be featured throughout the campaign, including a 30-second TV spot which incorporates the new vehicle with scenes from THOR. The spot will run on network sports and spot TV, as well as across 18 cable networks such as ESPN, Adult Swim and Comedy Central. 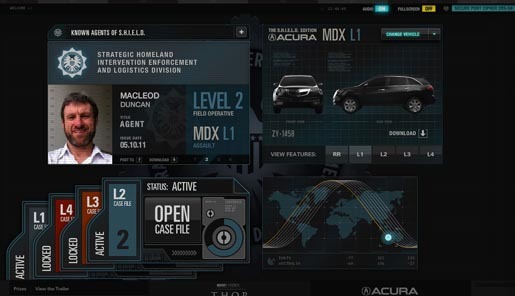 Acura has released unique S.H.I.E.L.D.-themed video and content across several websites to drive traffic to joinshield.com and recruit users to join S.H.I.E.L.D. The “recruitment” theme is played out on Marvel’s website, Fandango’s THOR page and Facebook advertising, as well as in unexpected places such as LinkedIn. A S.H.I.E.L.D. Agent Test Kit, sent out to media writers, contains a number of S.H.I.E.L.D.-themed articles, including a vial of blue “paralytic concentrate,” a scorpion in a jar, a key chain and a Livescribe pen. The SHIELD recruitment campaign was developed at developed by Acura’s agency of record, rp&, a division of RPA, Santa Monica. Digital work was done at B-Reel by executive creative director John Hage, head of art Philip Squier, art director Josh Gilman, copywriter James Embry, user experience producer Anita Cheung, project manager Elizabeth Goldstein, technology director Rick Campbell and technologist Greg Lopez. The Kit was produced and distributed at Dead As We Know It, Brookyn.